The CFS member is always prepared to respond when an emergency occurs within the community. They are usually notified of an emergency by either a pager, air raid siren, telephone or radio call. 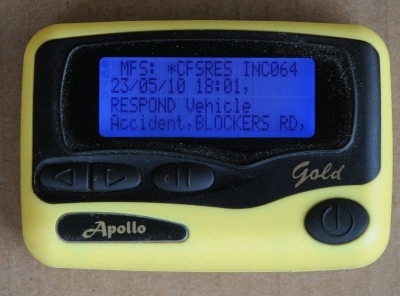 The most common means of notification is via a pager, which all operational members are issued with. 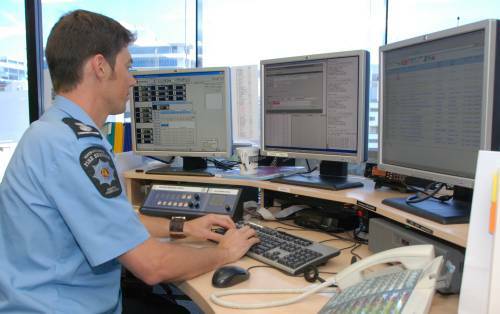 These pagers are part of the State Government Radio Network (GRN) and are managed by a private service provider. The pager screen will display the call details provided to a call centre via a 000 call. A portion of an example message is shown above, which provides all the call details, such as who is responding, what the emergency is and where it is. The air raid siren is often used by brigades to notify brigade members and the community of an emergency in the area. This siren can provide a backup if the paging system fails to operate, and also act as a warning to the community of a possible emergency in the area that they should be aware of. Each Brigade and Group will have a policy on the use of the siren which will vary between areas. Contact your local brigade for more information on this.